ECMC dedicates the "Anthony V. Mannino Comfort Room"
Erie County Medical Center (ECMC) Corporation held a dedication and ribbon-cutting of the “Anthony V. Mannino Comfort Room” on August 27th. 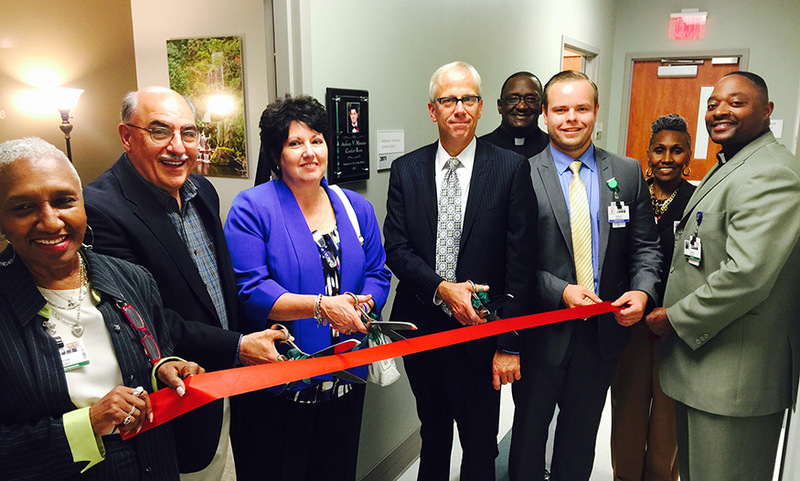 Preparing to cut the ribbon during the "Anthony V. Mannino Comfort Room" dedication event held August 27, 2015, in the Medical Oncology (Cancer) Center in ECMC's new Ambulatory Center, are (front row, l. to r.): ECMC Cancer Care Advocate/Outreach Coordinator Charlene Cherry; Tony Mannino, Treasurer, Anthony V. Mannino Foundation; Cindy Mannino, President, Anthony V. Mannino Foundation; Richard Cleland, CEO, ECMC Corp.; Nicholas Duquette, Program Director, Wound Center, ECMC; Elder Garney Davis Jr., Chief Trauma Chaplain, ECMC; and (back row, l. to r.) Rev. Dr. James Lewis, Director, Pastoral Care, ECMC, and Mrs. Lewis. 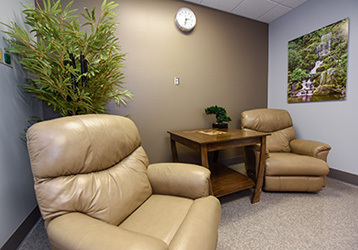 The "Anthony V. Mannino Comfort Room" is a quiet place for cancer patients to reflect, discuss treatments with their doctors and spend time with family. Anthony V. Mannino was a young man who lost his battle with cancer on March 8th, 2009, at the age of 21. The room is located in ECMC’s Ambulatory Center building on its second floor in Medical Oncology, part of the Center for Oncology Care, which specializes in head and neck, plastic and reconstructive surgery, dental and medical oncology, maxillofacial prosthetics, and breast oncology. ECMC medical oncologists offer expert clinical care that emphasizes aesthetic principles in a healing atmosphere. A collaborative team of physicians discusses each case in a group setting to develop a comprehensive approach for each patient. With its Asian theme, the “Comfort Room” reflects the personality of Anthony, an avid martial artist. 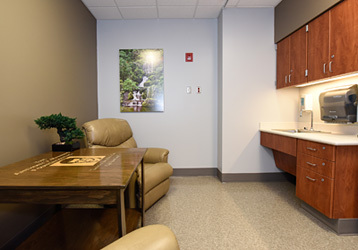 The “Comfort Room” is painted in relaxing earth tones with soft lighting installed and two recliners available for patient comfort. 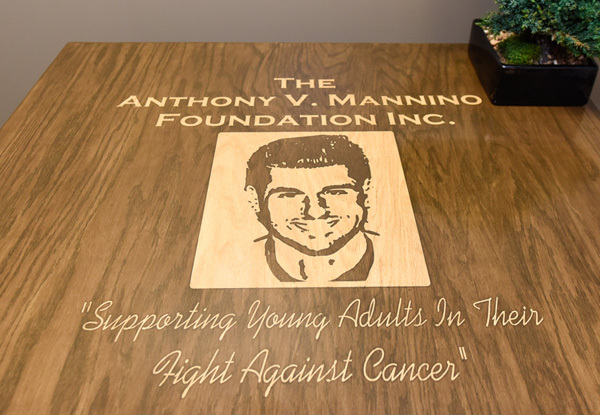 A custom table with a modern Japanese design displays Anthony’s portrait and The Mannino Foundation name engraved into the table. Included are a bonsai tree and a six-foot tall bamboo tree. On the wall is a large photo print of a Japanese waterfall. Another wall includes the words “Compassion, Hope, Courage” which is a slogan used by “The Mannino Foundation.” The theme has a deeper meaning for anyone experiencing difficulty. The bonsai tree traditionally represents stability and perseverance. The waterfall is a sign of change and water is often associated with relaxation and healing.